Aloha! 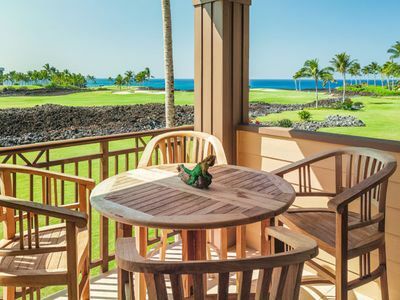 Hali’i Kai #22A is located in beautiful Hali'i Kai at Waikoloa Beach Resort on the Kohala Coast. 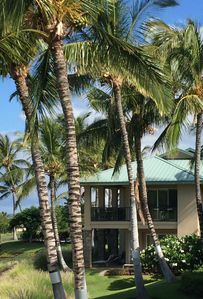 Our villa welcomes you with the serenity of a luxury retreat and beautiful view from the lanai of the Coconut Grove, Kohala Mountains, Hapuna Bay and Mauna Kea. 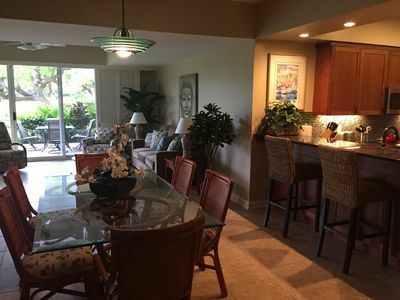 The two bedrooms are separated by the living / dining / kitchen. 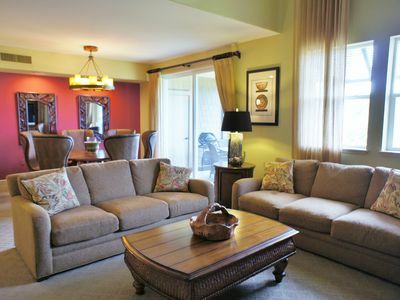 Great location for families on vacation or couples that want to share expenses but still have a bit of privacy. 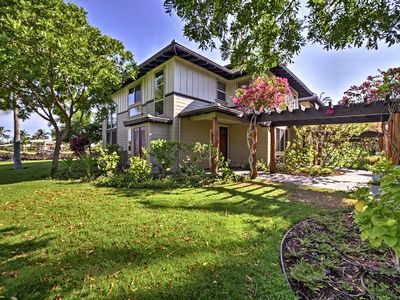 Living space is 1460sf with a quiet setting to entertain friends, family conversation or just reading a good book. 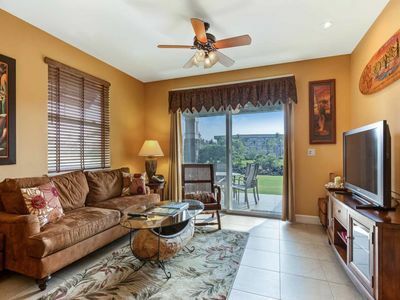 The villa features a lovely single level, second floor, 2 bedroom 2 bath condominium that sleeps 6. The master bedroom features an over-sized king bed and the second bedroom features two queen size beds. Each bedroom has a beautifully featured bath. The master bath includes dual vanities, a separate soaking tub and large walk in shower, with granite and tile throughout. The second bath includes dual granite vanities with a tub shower combo. 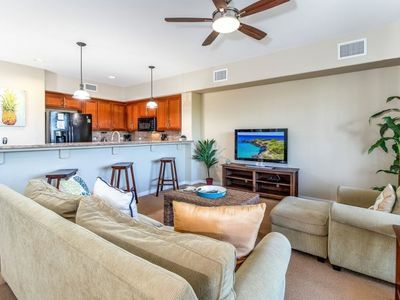 Other features include a professionally decorated and well-maintained kitchen that includes granite counter tops, black on stainless steel appliances and African mahogany cabinets. The open floor plan features a living dining combination with 2 bedrooms on opposite sides of the living area, allowing for privacy in a multi-couple visit or quiet time for the children while Mom and Dad listen to their music! 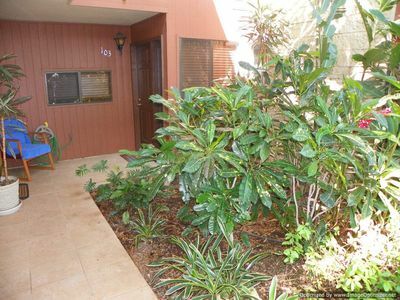 Parking is in front of the condominium garage directly in front of the condominium entrance. 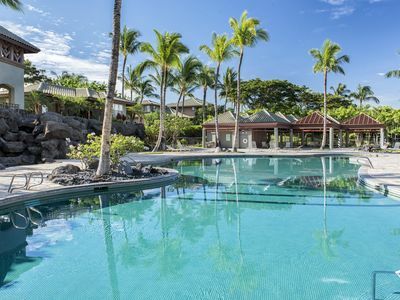 Hali’i Kai is a five star private gated community with amenities that include the Ocean Club, a multi-tiered resort style pool with aqua loungers, sand bottom spa and ocean front views. The ocean side café and bar are located poolside so you can spend the day at the pool and have food and refreshments as close as 20 steps away. 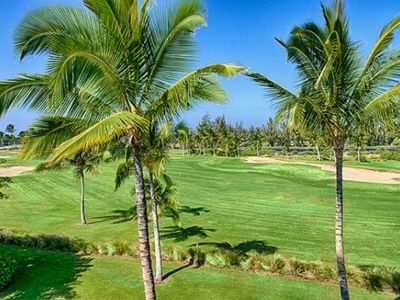 The Ocean Club features an exercise area to start your day with a run on a treadmill with a view of the beautiful Pacific Ocean. 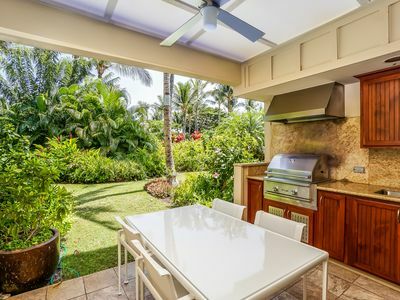 The walk from #22A to the Ocean Club is 10 minutes on Nawahine Place where you can greet the neighbors with a friendly good morning or bid them good evening after a fantastic day at the Ocean Club. 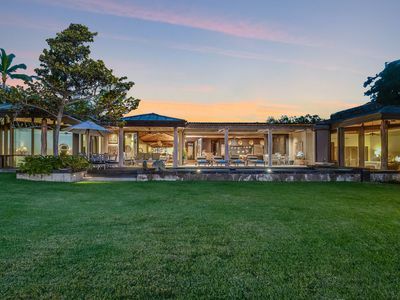 You must experience at least one sunset at the Ocean Club! Within 24 hours of arrival you must register at the Hali'i Kai / Castle Management office. There is a mandatory $20 daily fee collected by Castle at the time of registration. 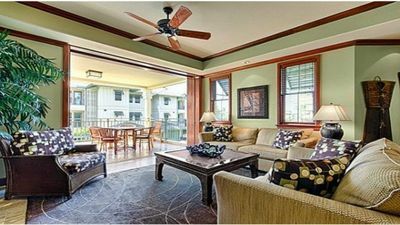 This is in addition to any fees paid to the 22A owner via Vrbo. 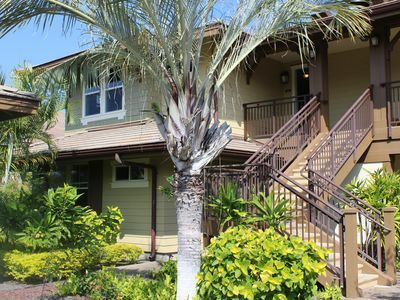 Building 22 is one of 24 buildings in Hali’i Kai, located near the entry gate, making it easy for your morning walk up and down Waikoloa Beach Drive with a stop at Starbucks and various other shops in the Queen’s Market Place. 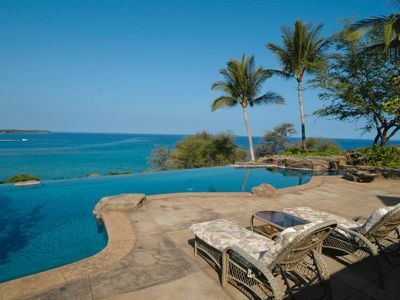 Located just behind the Queen’s Market is Anaeho’omalo (A’bay) and Waikoloa Beach, both open to the public. You can snorkel, swim, enjoy the sun and listen to the sounds of the ocean on these two beaches or one of the many beaches on the Big Island of Hawai'i. 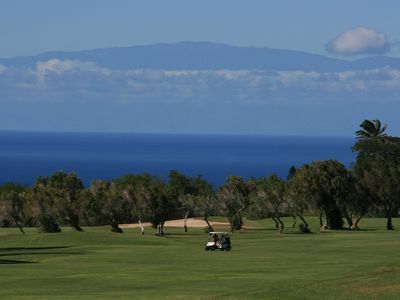 There are dozens of web sites that describe the many activities of the Big Island. www.lovebigisland.com/activities-to-do/ is a good start. 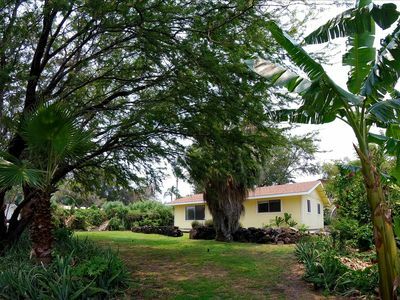 Car rental is recommended for your visit to the Big Island, Hawai’i. 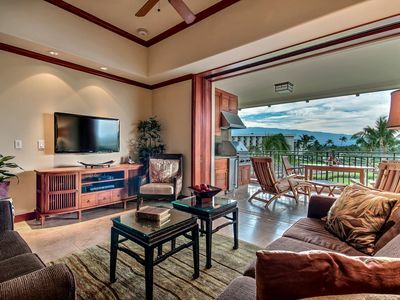 Please enjoy your stay in our home away from home at beautiful Hali’i Kai, Waikoloa Beach Hawaii. Mahalo! 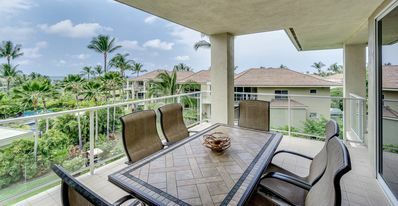 Palm Tree Haven Luxury Condo w/ Garden View- Air Conditioned, Near Golf, Private Beach Club, WiFi! Kolea 15L Luxury. Direct Beach Access. No Fees. 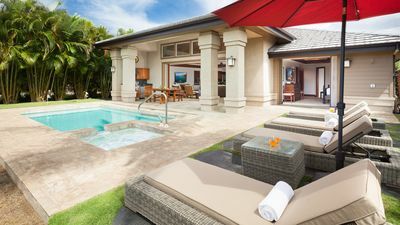 Luxury Mauna Lani Golf Villa - Mins to Beach!